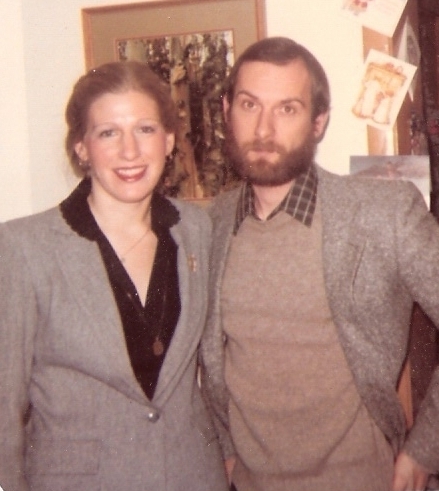 When I was a graduate student in the early 1980’s (see above photo of earnest yet clueless grad student with his lovely wife) one of my professors at Montana State University challenged me to describe my approach to counseling in a single sentence. The assignment was simple: just complete the thought: Counseling is. I don’t recall my answer at that time but in my heart I was thinking: Counseling is a strange and terrifying process that I am woefully unprepared to do. Thirty years and several thousand counseling hours later I find many parts of that answer are still true. Helping people deal with life in a fallen world was actually more complicated than I knew as a young counselor. During the last three decades, the profession has also changed dramatically. Many of the assumptions about human behavior turned out to be really dumb as the research caught up with theory. Spurious methods like primal scream and rebirthing therapy has given way to evidence based practice. That is definitely progress in the right direction. • Counseling is arduous. Someone once said to me, “So, how hard can counseling be? You sit and talk to maybe six people per day. You give some advice, tell ‘em to read a book, nod a lot. Sounds like a pretty cushy job.” This was the same person who observed that being a pastor also couldn’t be that hard. After all they only work one morning per week. Sad and foolish, huh? In the real world, engaging hurt, upset and often angry people is not cushy. Being the person who encourages people to take a hard look at the pain, ugliness and regret of one’s life is not glamorous or easy. Most people don’t want to go there. Counselors simply make sure people aren’t alone when they finally agree to go there. • Counseling is all about truth. My dad was a cattle rancher but he had good insight into human nature. He often told me, “Son, a cow brute will only go in the direction she is looking. If she is looking left, she will go left. People are not like that. They will look left, tell you they are going right and immediately go backwards.” Without a doubt, humans have an unusual capacity to be deceptive and often deceive themselves. Sadly, we believe distortion and mistruth more easily than we embrace truth. The truth discovery process is hard but worth it. Jesus said, “I am the Way, the Truth and the Life…” (John 14:6), and “God is spirit, and His worshipers must worship in the Spirit and in truth.” (John 4:24), and “If you continue in My word, then you are truly disciples of Mine; and you will know the truth, and the truth will make you free.” (John 8:31, 32). The Lord Jesus Christ, God’s Word and a clear view of reality creates freedom. The lies and distortion create an invisible prison. • Counseling requires application of truth. The hard work of counseling does not end with insight. I can accumulate great truth but it is meaningless if I do not respond to it. Truth discovery is challenging but truth application is even harder. The formula is not new. I am responsible for what I know. In the back of my mind, in every session is the question: So what? Insight is wonderful. But making a truth-based response is even better. I have spent over half my life in the counselor’s chair. I see the process of human change no less daunting than when I first began. And I still scan people’s eyes for a view to their hearts. I also keep in mind that the direction they are looking may not have anything to do with where they are going. By grace we rejoice in the truth and courageously embrace its solemn duty. But it’s fortnight. Actually it has been a bunch of fortnights since I wrote last. My day job has been getting in the way of my fortnight writing. Anyway, go out there and do the hard work of living in the truth.